DUBUQUE, Iowa — Loras College, a private, a four-year Catholic liberal arts college, announces the launch and is accepting applications for its one-year, postbaccalaureate premedical program that provides the needed coursework commonly required for entrance to medical schools. Individuals can apply starting mid-January. The Loras premedical program is designed for people who have completed a bachelor’s degree but do not have the prerequisite courses to apply to one of the following professional schools: medicine, optometry, dentistry, podiatry, physical therapy, physician assistant, or veterinary medicine. 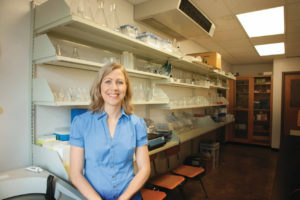 “Some extremely bright and talented people finish their undergraduate degrees with majors in something outside of science and may even work for a few years before they finally recognize their inner calling to become a medical doctor,” said Kate Cooper, Ph.D., director of the program and associate professor of biology. Cooper and a team of faculty will create an individualized timeline for each student to reach their overall goal. Students enrolled in the Loras postbaccalaureate premedical program will benefit from access to a premedical advisor and the accompanying guidance they provide to students in selecting courses, preparing for the Medical College Admission Test (MCAT), seeking research, clinical, and volunteer opportunities, and navigating the often complicated primary and secondary application processes. Financial aid opportunities are available to those who qualify. Visit www.loras.edu/postbaccalaureatepremed/ or contact Cooper at premed@loras.edu or 563.588.7956 for more information on Loras’ postbaccalaureate premedical program.